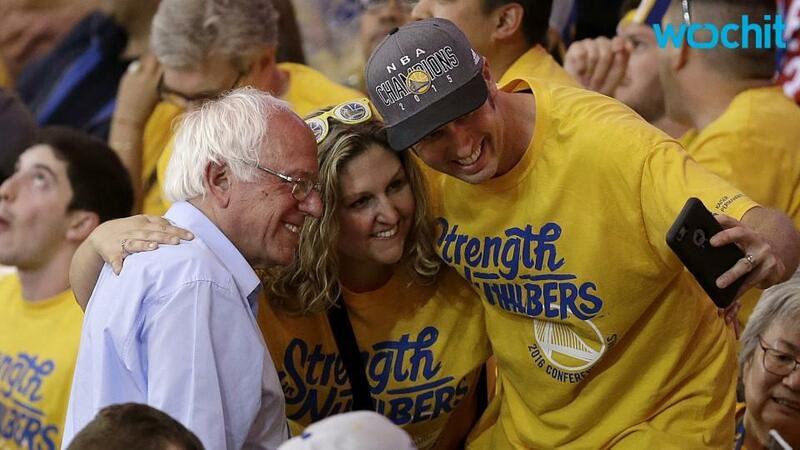 Bernie Sanders attended Monday night's huge Game 7 between the Golden State Warriors and the Oklahoma City Thunder, calling the Warriors' victory a "very good omen" for his campaign. The Warriors erased a 3-1 deficit against the Thunder, winning the critical Game 7 and advancing to the NBA Finals for a second-consecutive year. Sanders saw parallels between the Warriors and his own campaign. "I like comebacks," he tweeted of Golden State's win. The Vermont senator currently trails Clinton by 8 points in the RealClearPolitics average of several California polls ahead of next week's Golden State primary. Mathematically, it's virtually impossible for Sanders to overtake Clinton in the delegate count ahead of the July convention. Sanders arrived at halftime of the game, which was held at the Oracle Arena in Oakland, California. He sat alongside actor Danny Glover. The pair were in section 108, row 15, according to a pool report, which called the seats "good" but "not the ones frequented by millionaires and billionaires." The Warriors were trailing Oklahoma City at halftime when Sanders arrived. "We came in the second half and the Warriors turned it around," Sanders said, per another pool report. "The Warriors were down 3-1 and they turned it around and I think that that's what we're going to do, too. A very good omen for our campaign." Smiling, Sanders said the comeback was "absolutely" because of him. "No question about it," he said. "What other explanation is there?" The Vermont senator was also asked what he would've said had they lost. "Hey, in politics, you gotta take your shots," he answered. Last week, Golden State was down three games to one. Tonight, they finished off a great comeback in California. I like comebacks.